Finally got to buy an ultrasonic cleaner during Black Friday. 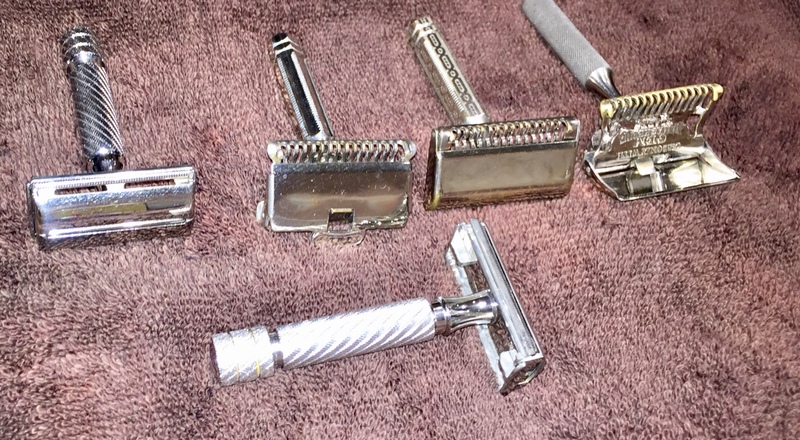 All my razors got their bath. Works really well and it’s easier versus the toothbrush method. Too bad my brushes don’t fit in the cleaning dish. I've read some clean their brushes by hanging them so that only the knot is submerged. Mostly to avoid any chance of the knot coming off from vibration, but maybe that could solve your problem of the brush not fitting in the dish. Where did you purchase this Ultrasonic cleaner? And, his long did it take for the cleaner to get your razors to look like that? Where they very crusty when you started? (12-04-2017, 04:43 PM)oldjoe Wrote: Where did you purchase this Ultrasonic cleaner? And, his long did it take for the cleaner to get your razors to look like that? Where they very crusty when you started? I purchased on Amazon. They run from $35 - $50. The one I got has 4 cleaning cycles with 4 being about 6 minutes or so. Actually my razors were well preserved, looked dull to begin with. I think it’s worth the money. I believe they also sell them at Bed, Bath, and Beyond.